- Pressure drop thru coupling based on flow giving 15 FPS fluid velocity thru nominal bore size. - Excellent flow characteristics for continuous duty applications. See flow chart. - High strength steel poppet guides prevent break up and washout of coupling valving during high surge and shock conditions. - Flat crested stub-acme threads and all steel construction withstand storage and rig-up damage. - Structurally compatible with weight of 5,000 P.S.I. flex-hose and system induced shockloads. The 5TV series high pressure hydraulic coupling is designed for rugged hydrostatic drive applications in the mining and oil industries. Service in many such applications has proven the design compatible to extreme pressures, structural and system induced shockloads. 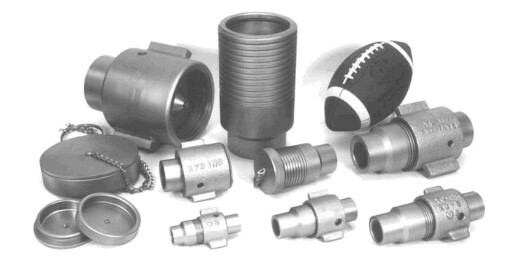 The construction makes the coupling attractive in applications having low operating pressures. NOTE ― Not for use with gaseous fluids.